The Baan Taling Ngam Resort & Spa is nestled amidst a coconut plantation with turquoise seas providing a spectacular backdrop. 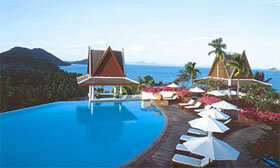 Enjoy breathtaking views of the Gulf of Thailand and the Angthong National Marine Park. Many of the 70 spacious and richly decorated guest rooms, suites and villas offer magnificent views of the waters below. Deluxe Rooms are furnished in traditional Thai style to offer a touch of elegant exoticism. Exquisitely comfortable, large beds directly face the sea, so you can enjoy the breathtaking beauty of the Gulf of Thailand from the moment you awaken, and relish the incomparable sunset in the evening. Immense sunken tubs and separate shower stalls. 70 guest rooms, suites, and villas offer breathtaking views of the sea – relax with enchanting views of the setting sun at day’s end. Secluded oceanfront villas are nestled amidst rambling wildflowers and lush groves of trees at the edge of the shimmering sea. Our Deluxe rooms and Suites feature exquisitely comfortable beds with silk Thai pillows, immense sunken bathtubs, and elegant balconies laid with lovely ceramic tiles make the Baan Taling Ngam Resort and Spa the ultimate luxury hideaway. BAAN TALING NGAM ROOMS: Rooms vary in size from 67 to 120 SQM. All accommodations contain modern Thai interior with teak floors and bathrooms with individually designed toiletries and separate shower and bath tub. King bed with large private balcony equipped with table, chairs and two sun-lounges. Wide panoramic view over the Gulf of Thailand and Marine Park, facing the sunset. Modern Thai style interior, with polished wooded floors. Sitting area, writing desk, DVD, hi-fi, TV. Luxurious bathroom with separate Toilet, oversized bathtub separate shower booth and double basin. BAAN TALING NGAM VILLAS : Congregated around a series of 5 swimming pools, and with views over lush gardens and the Gulf of Thailand, the villas are spacious and reflect the rich traditions of Thai culture. Interiors range from 120 to 320 SQM, with 1, 2 or 3 bedrooms, and lofty arched ceilings with private balconies. The villas have access to all the services and facilities provided by the resort. One king-sized bedroom and one adjacent twin bedded room, bathroom, one guest toilet, kitchenette and separate sala featuring large living & dining area. Large open wooden terrace with sun loungers, table and chairs. One king-sized bedrooms; Modern Thai style interior, with polished wooden floors. Large terrace with access to kitchenette and guest bathroom. Bedrooms equipped with its own black slate-tiled bathroom. Adjacent to semi-private Villa pool. One king-sized bedrooms and one adjacent twin bedded room. Modern Thai style interior, with polished wooden floors. Large terrace with access to kitchenette and guest bathroom. Two bedrooms connected through a common foyer on lower level, each equipped with it’s own black slate-tiled bathroom. Adjacent to semi-private Villa pool. Two (king-sized bedrooms and one adjacent twin bedded room. Modern Thai style interior, with polished wooden floors. Large terrace with access to kitchenette and guest bathroom. Two bedrooms connected through a common foyer on lower level, each equipped with it’s own black slate-tiled bathroom. Adjacent to semi-private Villa pool. One king-sized bedroom, Very large living space comprising of a dining, reading and sitting area with views over the Gulf of Siam. Modern Thai style interior, with polished wooden floors. Large terrace with access to kitchenette and guest bathroom. Two bedrooms connected through a common foyer on lower level, each equipped with it’s own black slate-tiled bathroom. Adjacent to semi-private Villa pool. One king-sized bedroom and one adjacent twin bedded room, Very large living space comprising of a dining, reading and sitting area with views over the Gulf of Siam. Modern Thai style interior, with polished wooden floors. Large terrace with access to kitchenette and guest bathroom. Two bedrooms connected through a common foyer on lower level, each equipped with it’s own black slate-tiled bathroom. Adjacent to semi-private Villa pool. One king-sized bedroom, 2 bathrooms, one guest toilet, kitchenette and separate sala featuring large living & dining area. Large open wooden terrace with sun loungers, table and chairs. Sea-view and direct access to beach. One king-sized bedroom and one adjacent twin bedded room, 2 bathrooms, one guest toilet, kitchenette and separate sala featuring large living & dining area. Large open wooden terrace with sun loungers, table and chairs. Sea-view and direct access to beach.